NPR and the New York Times have reported on "rioters" before. 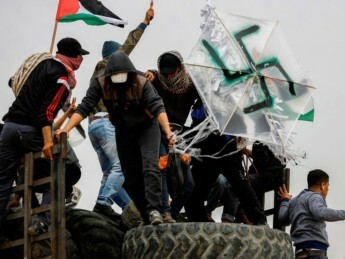 So why, when covering crowds of men hurling stones, throwing firebombs, attacking a border fence, setting fire to fields and buildings, and shooting Israelis, does it describe the perpetrators as "protesters"? 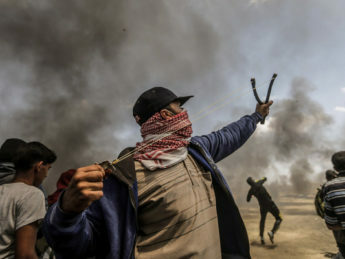 As Palestinians in Gaza, backed by Hamas and other Palestinian terror groups, continue to riot, and Israeli soldiers struggle to keep the demonstrators from the country’s borders, media coverage has often failed to accurately report on the clashes. 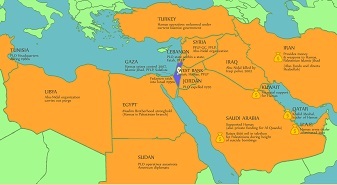 BBC's Jeremy Bowen promotes the anti-historical account that the Six Day War was a war of choice for Israel and that the Israeli-Palestinian conflict arose as a result of that war. Washington Post follows BBC down the “cycle of violence” or “summer of violence” rabbit hole in futile hunt for 2014 Gaza war's origin. Along with foreign journalists, CAMERA's Tamar Sternthal was invited to testify at a Knesset subcommittee meeting on media bias. Do the reporters' proclamations of professionalism and objectivity hold up to scrutiny? The ‘fog of war’ sometimes comes with ‘the fog of journalism.’ That's when impercison undermines accuracy. Here The Washington Post obscures causes of the 2014 Hamas-Israel war in the Gaza Strip and Palestinian culpability dwindles. In May-June 2013, the Qatar-based Arabic satellite television channel aired its 'Nakba' (catastrophe) film depicting a one-sided version of Israel's struggle for independence. Alarm over reports that the Syrian regime is preparing to use chemical weapons offers an opportunity to provide some clarity about what lies at the core of the Middle East's instability.